i. India’s first ‘smart fence’ pilot project was inaugurated by Union Home Minister Rajnath Singh along the Indo-Pak border at the BSF Headquarters in Ploura, Jammu. Smart fencing uses a number of devices for surveillance, communication and data storage. ii. The pilot project entails deploying laser-activated fences and technology-enabled barriers to plug vulnerable gaps along frontiers. · General Bipin Rawat is the Present Chief of Army Staff of Indian Army. i. A bilateral meeting on Tourism Cooperation between India and Morocco led by the Minister of Tourism, Air Transport, Handicraft and Social Economy, Kingdom of Morocco, Mohamed Sajid and the Minister of State for Tourism (IC), Government of India, K. J. Alphons, held in New Delhi. ii. During this meeting both the Ministers agreed to enhance the tourism cooperation between India & Morocco and to work towards increasing tourist arrivals between both countries. iii. This meeting was followed by signing of an agreement of cooperation between the India Tourism Development Corporation and La Societe Marocaine D’Ingenierie Touristique, also known as Moroccan Agency for Tourism development (SMIT). · Morocco Capital: Rabat, Currency: Moroccan dirham. i. The Delhi government signed an MoU with the Seoul Metropolitan Government to work closely in the fields of environment, tourism, wastewater and solid waste management, infrastructure and public health. ii. The MoU on the 'Friendship and Cooperation Agreement' was signed by Delhi Chief Minister Arvind Kejriwal and Seoul mayor Park Won-Soon in Seoul. · Seoul is the capital of South Korea. · Korean won is the currency of South Korea. i. The Defence Acquisition Council (DAC), chaired by Raksha Mantri Smt. Nirmala Sitharaman accorded approval for the procurement of equipment for the Defence Forces valued at over Rs 9,100 crores. ii. The DAC approved procurement of two Regiments of Akash Missile Systems under 'Buy (Indian)' category from M/s BDL. i. The Union Minister for Railways and Coal, Piyush Goyal inaugurated the ‘first ever’ India Tourism Mart (ITM 2018) in the presence of Union Tourism Minister, K J Alphons and the Tourism Minister of Morocco, Mr. Mohamed Sajid, in New Delhi. ii. The India Tourism Mart is being organized by the Ministry of Tourism in partnership with the Federation of Associations in Indian Tourism and Hospitality (FAITH) and with support of State /UT Governments. i. All-women crew of INSV Tarini has bagged the prestigious Tenzing Norgay National Adventure award for beating the odds in water with their enduring skills and sailing across the world for eight long months. ii. The award is the highest national recognition for outstanding achievements in the field of adventure on land, sea and air. · The INSV Tarini team, led by Lt. Commander Vartika Joshi, is comprised Lieutenant P. Swathi, Lieutenant Pratibha Jamwal (Air Traffic Control specialists), Lieutenant Vijaya Devi, Sub Lieutenant Payal Gupta (both Education officers) and Lieutenant B Aishwarya, a naval architect. i. Kerala Tourism has won two prestigious gold awards of the Pacific Asia Travel Association (PATA) for its innovative marketing campaigns. The awards were presented at a glittering function in Langkawi, Malaysia during PATA Travel Mart 2018.
ii. Kerala Tourism got the first gold for its ‘Yalla Kerala’ travel advertisement print media campaign in the Gulf countries. The second gold award came for an innovative poster Kerala Tourism had developed for the third edition of the Kochi-Muziris Biennale (KMB), the biggest contemporary art show in South Asia. · Kerala CM: Pinarayi Vijayan, Governor: P Sathasivam. i. The 70th annual primetime Emmy honors handed out at the Microsoft Theater in Los Angeles. Michael Che and Colin Jost hosted the show. i. The government has proposed amalgamation of Bank of Baroda, Vijaya Bank, and Dena Bank to create India’s 3rd largest globally competitive Bank. ii. Finance Minister Arun Jaitley announced that the amalgamation will increase the banking operations and no employee will face any service condition adverse to present conditions. The government had announced in the budget that consolidation of banks was also in the agenda of the government. · Bank of Baroda Headquarters in Vadodara. · Vijaya Bank Headquarters in Bengaluru. · Dena Bank Headquarters in Mumbai. i. The Central Board of Direct Taxes (CBDT) announced that no withholding tax will apply on interest payments made by an Indian company or a business trust to a non-resident in respect of offshore rupee-denominated bonds issued between September 17, 2018 and March 31, 2019.
ii. The move is expected to incentivise foreign exchange inflows into India through low-cost offshore rupee-denominated bonds, popularly referred to as masala bonds. · Sushil Chandra is the chairman of Central Board of Direct Taxes. i. The 2018 Japan Open, officially DAIHATSU YONEX Japan Open 2018, is a badminton tournament which took place at Musashino Forest Sports Plaza in Tokyo, Japan and had a total prize of $700,000. ii. 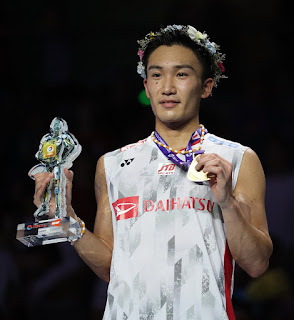 In men's singles category, Kento Momota of Japan had defeated Khosit Phetpradab to win the title. In Women’s Singles, Carolina Marin of Spain has defeated Nozomi Okuhara to win the title. i. Noted freedom fighter and former Odisha Minister Dolagobinda Pradhan passed away in Bhubaneswar. He was 93.
ii. A follower of Mahatma Gandhi, he took part in the Quit India Movement in 1942 and got imprisoned by the then British government for 3 years and two months.